We have a new site. During our morning visit, I was only halfway won over. I forgot what it is like to grow a site. I also forgot what it is like to get a new group of children acclimated to a site. We had to move our forest site. So many obstacles to overcome! Nature gives and nature takes, but she’s always THERE. Initially, the problem was a fallen tree across the path and with it loads of poison ivy. The tree was cut, the poison ivy dead and going dormant (for now), but the summer rain, so much rain, had eddied around the fallen tree and scrubbed away what hard pack dirt there was on the path and uncovered sharp, seemingly unmovable boulders and roots. What had already presented difficulty for the team to move gear in our trusty wagon into the woods each day, was now an all-stop. 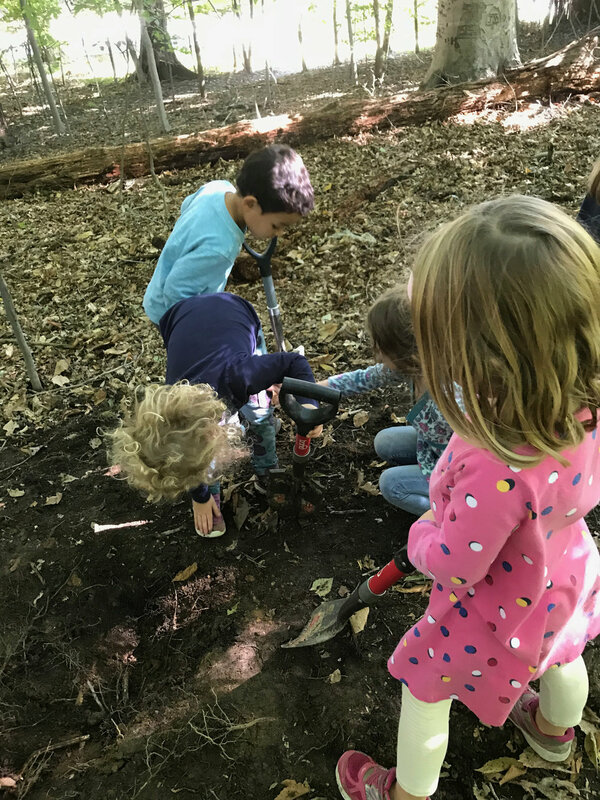 Over the Summer, one of our Tink camp counselors showed us a patch of woods that was close by what we call our “Climbing Hill.” The Climbing Hill is just an edge of a parking lot and the children enjoy going there. The ease of the walk, plus the openness of the path, made this new site attractive. During my site visits before our first trip I found that it was super easy to put up our blue tarp and the bathroom station options were amazing because of all the extra trees. It was the extra trees that made this possible site more attractive. Each time I went, it was dark, the sky barely visible. The darkness meant there was not even a speck of poison ivy to be seen. Now in the Fall, a bit of the canopy has opened up. It will be interesting to see what it is like when the leaves are down. The walk to the site was also attractive. I learned so many years ago (and a hard lesson it was) that the walk to the site can’t be a burden. It is being at the site that is important. Our walk to the Climbing Hill has almost always be pleasant. There were so many downsides to this new site. There were no clear boundaries. There were no boulders to climb. The walk there doesn’t feature any attractions like our Rocko Obama or Dragon Tooth Rock. So many things to add to the teaching and learning checks and balance list! Here we go. Our first visit, after many scouting trips, was last week. I teach two classes. The younger children (ages 3 and turning 4) go to the forest in the morning. This would be their first trip out of the school and the co-oping team’s first visit to the forest. I remembered that most of our work with the little ones is about the walk itself. So many of them are amazed at the idea that WE can stop traffic. They simply cannot believe that this is possible. They step to the edge of the street, stop, and look in wonder at the whole scene. Amazing. Once (finally, phew) we arrived at the forest site, we set up without that magic “reveal” which is only possible by having the blue tarp set up before the children walk on site. This will take time as the team becomes more familiar with the routine and set-up. I forgot how important that magic reveal of the blue tarp tent is as it can be seen winking at us as we walk in — even though setting up the environment in preparation of the children’s arrival is something we are totally committed to. Oh well. That goes on the list too. Must have the blue house set up first. Check. Then when we got there, the littles had their snack and then explored a bit, but after about twenty minutes, a few of them asked me when we were going to go back to school. Uh oh. We still had two hours to go! I watched their play range, the digging, exploration, it was tough for them to keep steady engagement with the environment. That’s because there wasn’t one. I almost threw away the list AND the map to the site, I tell you. I walked the children out early, making the trek to our pick-up area. We stopped by the creek for some stone throwing. While they threw their stones, I wondered how quickly I could abandon the plan to also take the afternoon class to the site. At noon, my 4 and turning 5-year olds arrived. We held our pre-forest meeting. Almost all of these children are familiar with our old Blue House site, so I had to talk them through the whole thing. I couldn’t really hide my disappointment with the new “dark forest site” which we most certainly needed to name. We also had to figure out the perimeter problem and the site’s lack of landmark boundaries. I was really hanging all of my hopes on these young forest rangers’ ability to recognize the possibilities this tiny bit of urban forest would offer us. There are things that I forgot. The littles need more. More time. More preparation. And most importantly, the play invitations that are created by other children. Next year, I know what to do. When things are working well, you forget about how those “working well” situations achieved lift-off in the first place. Start small, move slowly, and observe and reflect! The older children named the new site. They named it “Eagle Forest” because of the flag pole we found in the forest. The forest offered them exactly what they needed. The next time they visit this site, the littles will arrive with more context — communicated by the play invitations left by the older class — and their forest adventures will begin in earnest. We even found the boundaries! Look at the edges! The sunlight itself marks the edges of this small patch of forest. Thank you, nature. You always come through for us.